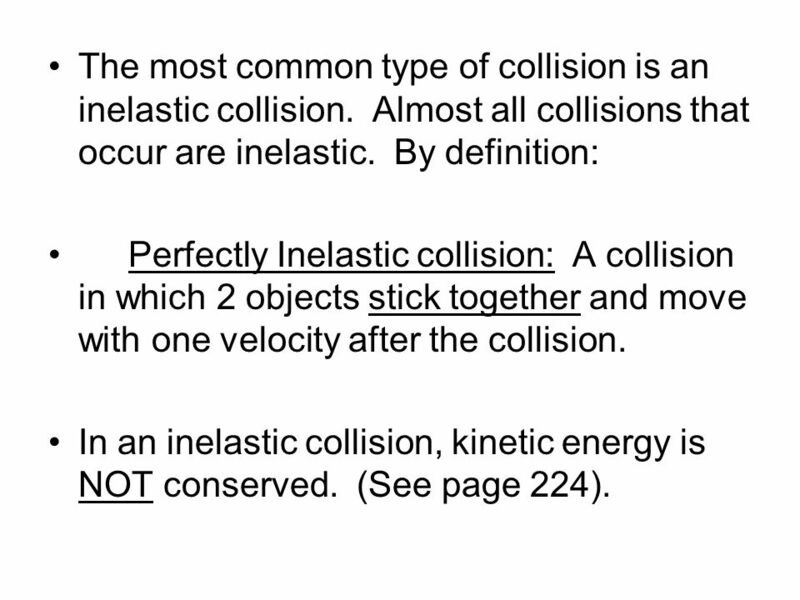 The most common type of collision is an inelastic collision. Almost all collisions that occur are inelastic. By definition: Perfectly Inelastic collision: A collision in which 2 objects stick together and move with one velocity after the collision. In an inelastic collision, kinetic energy is NOT conserved. (See page 224). In an Inelastic collision, the object is deformed. Some of the object’s kinetic energy is lost to sound, heat, and internal energy. (If an object is crunched, its atomic PE has increased). 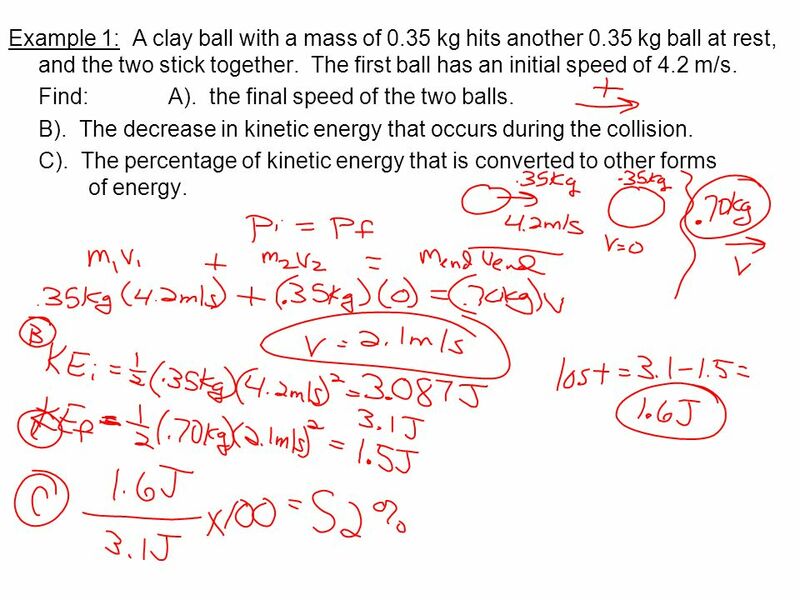 Example 1: A clay ball with a mass of 0.35 kg hits another 0.35 kg ball at rest, and the two stick together. The first ball has an initial speed of 4.2 m/s. Find:	A). the final speed of the two balls. B). The decrease in kinetic energy that occurs during the collision. C). The percentage of kinetic energy that is converted to other forms of energy. Example 2: A 0.75 kg ball moving at 3.8 m/s to the right strikes an identical ball moving at 3.8 m/s to the left. The balls stick together after the collision. Find: A). the final speed of the two balls. B). The decrease in kinetic energy that occurs during the collision. C). The percentage of kinetic energy that is converted to other forms of energy. 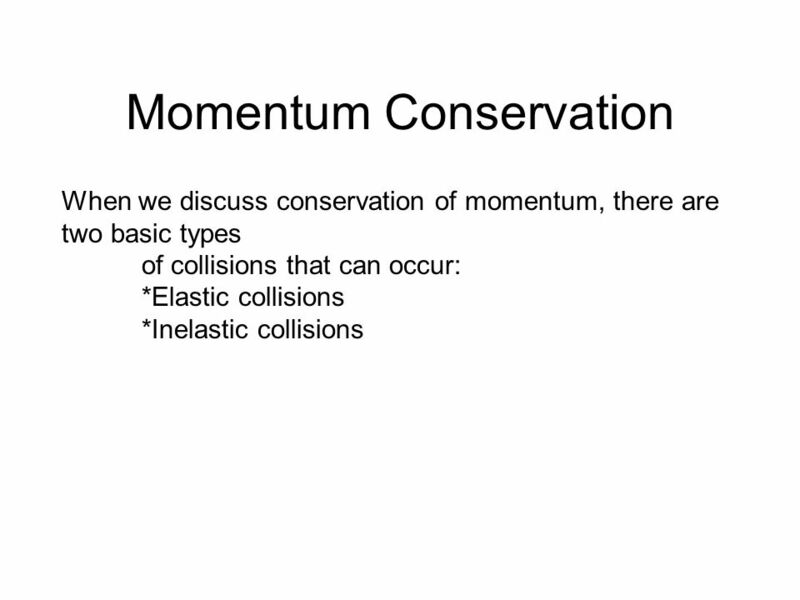 6 Elastic Collisions: A collision in which both momentum and energy are conserved. The objects rebound off of each other. True elastic collisions occur only between atomic particles (atoms and molecules) but collisions with billiard balls are close to elastic. 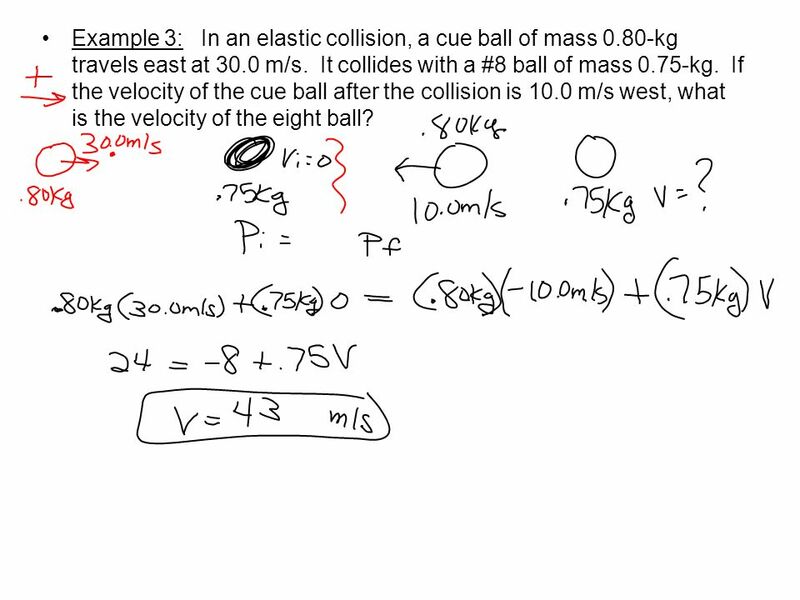 Example 3: In an elastic collision, a cue ball of mass 0.80-kg travels east at 30.0 m/s. It collides with a #8 ball of mass 0.75-kg. If the velocity of the cue ball after the collision is 10.0 m/s west, what is the velocity of the eight ball? 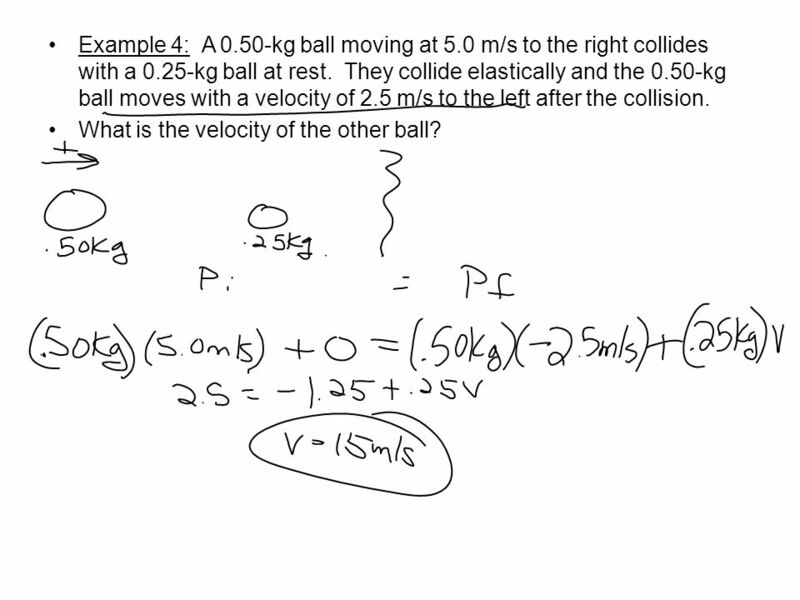 Example 4: A 0.50-kg ball moving at 5.0 m/s to the right collides with a 0.25-kg ball at rest. They collide elastically and the 0.50-kg ball moves with a velocity of 2.5 m/s to the left after the collision. What is the velocity of the other ball? 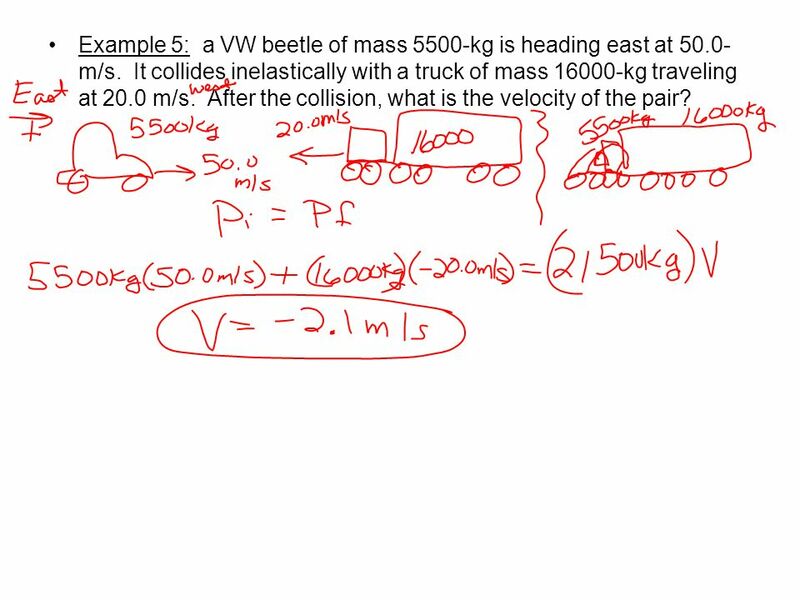 Example 5: a VW beetle of mass 5500-kg is heading east at 50.0-m/s. It collides inelastically with a truck of mass kg traveling at 20.0 m/s. 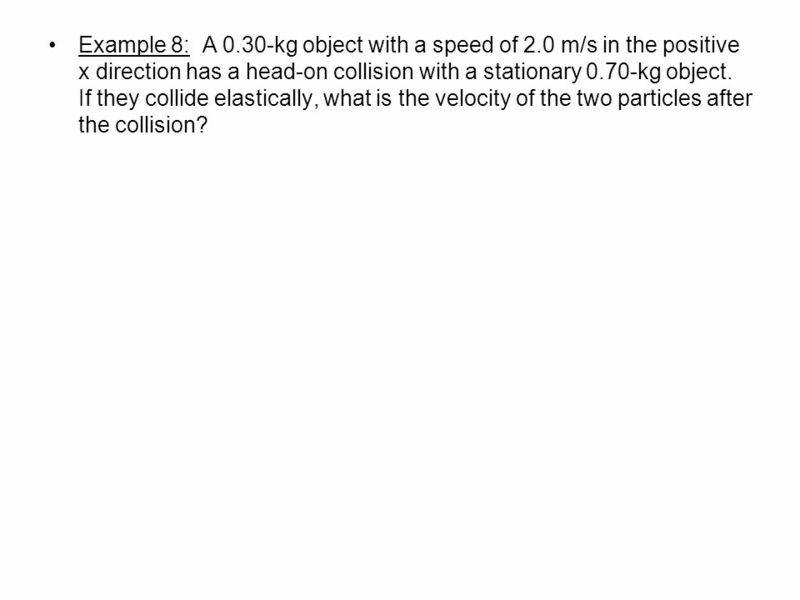 After the collision, what is the velocity of the pair? 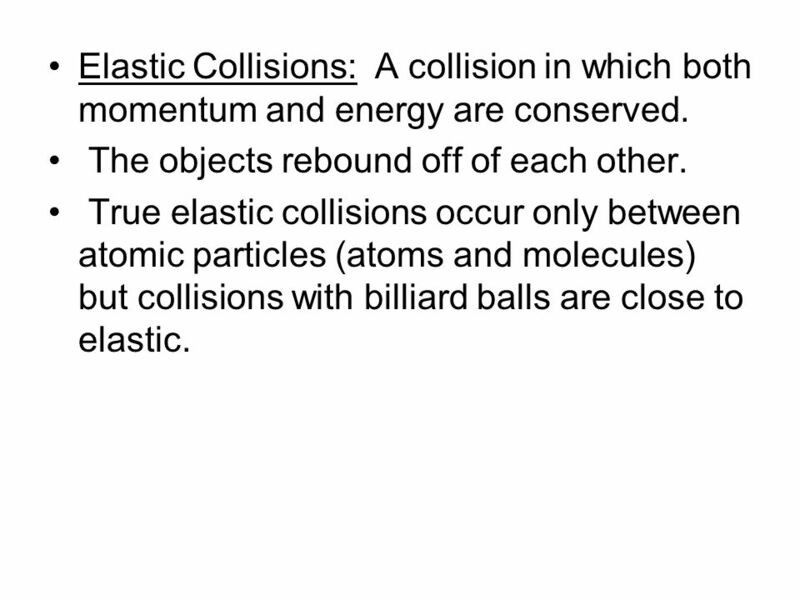 10 Example 6 Elastic: Two identical balls collide elastically with each other. The first ball moves away from the collision with a velocity of 3.0 m/s to the right, and the second ball moves away with a velocity of 4.0 m/s to the left. If the first ball’s velocity before the collision is 4.0 m/s to the left, what is the velocity of the second ball before the collision? After you have found the velocity, show that kinetic energy is also conserved. 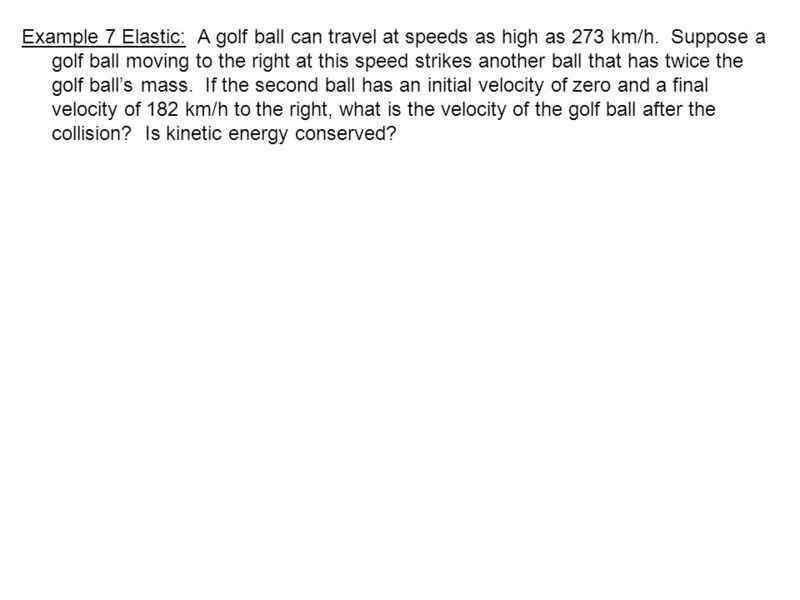 11 Example 7 Elastic: A golf ball can travel at speeds as high as 273 km/h. Suppose a golf ball moving to the right at this speed strikes another ball that has twice the golf ball’s mass. If the second ball has an initial velocity of zero and a final velocity of 182 km/h to the right, what is the velocity of the golf ball after the collision? Is kinetic energy conserved? Example 8: A 0.30-kg object with a speed of 2.0 m/s in the positive x direction has a head-on collision with a stationary 0.70-kg object. If they collide elastically, what is the velocity of the two particles after the collision? Chapter 7 Collisions. If the sum of the external forces is zero, then PRINCIPLE OF CONSERVATION OF LINEAR MOMENTUM The total linear momentum of an isolated. 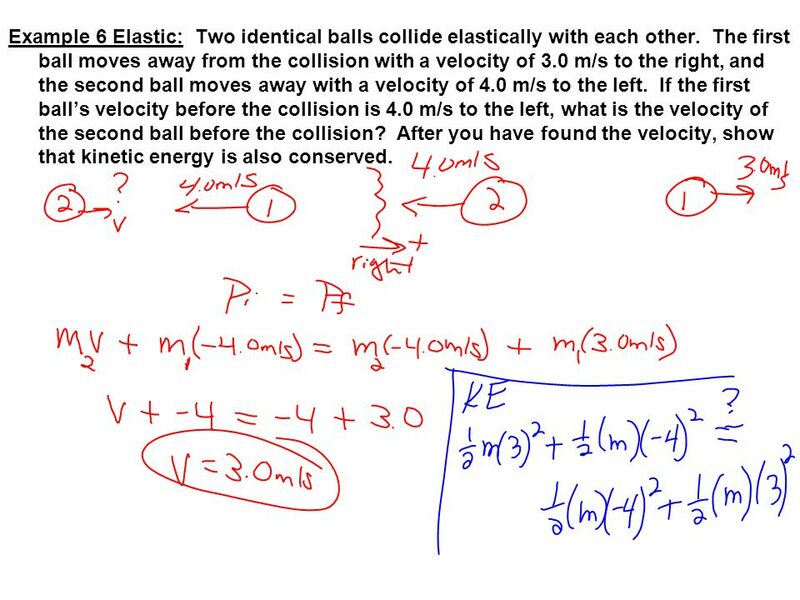 Chapter Elastic and inelastic collision. Objectives Identify different types of collisions. Determine the changes in kinetic energy during perfectly. Linear Momentum why is more force needed to stop a train than a car if both travel at the same speed? why does a little tiny bullet have so much impact? Warm up. 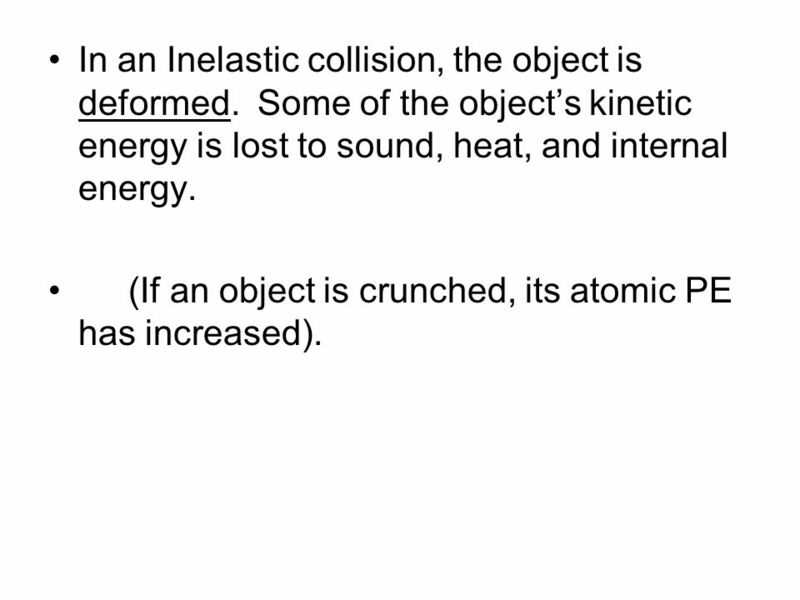 Physics Honors AB –Day 1/12/15-1/13/15 Momentum and Impulse. Elastic Collisions. Momentum and Kinetic Energy  An object in motion has a momentum based on its mass and velocity. p = mvp = mv  The object also has. AP Physics Impulse and Momentum. Which do you think has more momentum? Impulse Elastic Collisions 1 Conservation Collisions. Elastic and Inelastic Collisions. Collisions can be grouped into two categories, elastic and inelastic. Elastic Collisions: Kinetic Energy is conserved. Chapter 6 Momentum and Collisions. 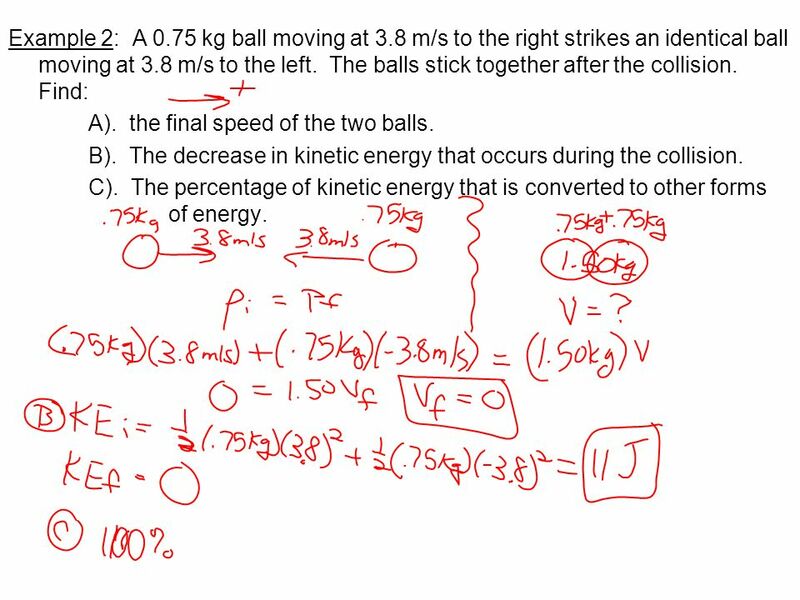 6.1 Momentum and Impulse Linear Momentum After a bowling ball strikes the pins, its speed and direction change. So.